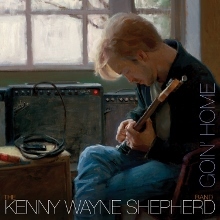 Here at The BluesPowR Blog, we like Kenny Wayne Shepherd‘s stuff like “Blue on Black” or “True Lies” just as much as the next guy or gal, but for us, his band has never sounded better than when they’re fully immersed in the blues, whether on “Shame, Shame, Shame” from the guitarist’s Ledbetter Heights debut or the band’s cover of Bessie Smith’s “Backwater Blues” from its 2011 studio album How I Go. Or, of course, almost any of the songs from the band’s latest CD Goin’ Home (out this week on Concord Records), which in many ways serves as a return to his roots for Shepherd, including recording for the first time during his two decade career in the guitarist’s hometown of Shreveport, Louisiana. Consisting of a dozen covers of songs from some of Shepherd’s earliest and strongest influences – all three Kings of the blues (Albert, Freddie, and B.B. ), Muddy Waters, Buddy Guy, Bo Diddley, and Stevie Ray Vaughan, among them – Goin’ Home is a splendid trip down memory lane performed by one of the industry’s preeminent blues-rock guitarists, joined here by such good friends as Keb’ Mo’, Joe Walsh, Warren Haynes, Kim Wilson, Robert Randolph, Ringo Starr, and the Rebirth Brass Band. Recorded during an 11-day gap in the band’s touring schedule, the album – Shepherd’s first on the Concord label and eighth overall – captures a majority of the 22 tracks cut during the session, all done live in the studio as you’d see performed, with everyone in the same room and only minimal overdubbing. The album kicks off with a greasy, rocking take on Freddie King’s “Palace of the King” that quickly reminds us of all this band – comprised of five-time Grammy Award nominee Shepherd on guitar and vocals, Noah Hunt on primary lead vocals, Stevie Ray Vaughan & Double Trouble member Chris “Whipper” Layton on drums, Tony Franklin (The Firm, Gary Hoey, Roy Harper) on bass, and Riley Osbourn on keyboards – is capable, accompanied by some strong female background vocals and the horns of the Rebirth Brass Band. That’s followed by an equally slick take on “Everything’s Gonna Be Alright” (Magic Sam, Little Walter) much in the vein of Magic Sam that also features some superb work on keys from Osbourn, and a simmering but intense “I Love the Life I Live” (Muddy Waters) that includes both Fabulous Thunderbirds frontman Kim Wilson on harmonica and Joe Walsh on guitar. In addition to the lyrics for those who don’t already know them, the album’s liner notes also contain some commentary from Shepherd about each song and/or how the original artist influenced him, here, for example, expressing that “One of the main reasons I didn’t sing on my albums for years was because I wanted to sound like Muddy Waters and just couldn’t get beyond the fact that I didn’t…Much of what I have learned about vocal phrasing I have learned from Muddy and his ability to blend singing with an almost conversational approach…”. That said, it’s not Shepherd, but rather vocalist Hunt – who, we’re reminded on Goin’ Home, has a great voice for the blues – belting this one out between some pretty mean licks on both guitar and harp. Like on other recent albums, Shepherd does take a few turns on vocals, including for Stevie Ray Vaughan’s “House is Rockin'” – a track selected by Vaughan’s former bandmate Layton – and again a bit later on another Freddie King number “Boogie Man”, a cut that allowed Shepherd to “step out of my normal role of playing rhythm guitar throughout the song and just focus on the singing and playing fills and solos like a lot of bluesmen tend to do”. In between, guitarist Warren Haynes trades vocals with Hunt on Albert King’s “Breakin’ Up Somebody’s Home”, revisiting one of the songs performed when Shepherd sat in for a few shows with Haynes’ “other” (and soon-to-be full-time) band Gov’t Mule, while Pastor Brady Blade Sr. (whose son Brady is the owner of the studio in which the album was recorded and co-producer of the project with Shepherd and Bill Pfordresher) provides some deep, spirited vocals to accompany Hunt’s on Bo Diddley’s “You Can’t Judge a Book by the Cover”. The slow, blistering blues of B.B. King’s “You Done Lost Your Good Thing Now” is one of several songs to feature some impressive work from Osbourn on keyboards, not to mention awfully soulful vocals from Hunt and a devastating guitar solo from Shepherd, who credits King with “encouraging me to focus on vibrato and playing the right notes at the right time. No musician has better shown that sometimes you can say everything you need to say with just one note” (a sentiment echoed many times over during the The Life of Riley documentary on King that is screening in the U.S. currently and that we’ll be telling you more about in the coming weeks). The band pays tribute to Johnny “Guitar” Watson with a driving “Looking Back”, “chosen for this record,” according to Shepherd, “because of its early rock n’ roll groove and playful flirtatious lyrics”. That’s followed by the funky slink of Buddy Guy’s “Cut You Loose” featuring Ringo Starr on drums, before Keb’ Mo’ joins the band (including sharing vocals with Hunt) for Albert King’s “Born Under a Bad Sign” – which has long served as the band’s intro music for concerts – complete with some stinging guitar and rich horns. A gritty, seven-and-a-half minute take on Muddy Waters’ “Still a Fool” caps off the album, featuring more scorching guitar – this time with a little help from Robert Randolph – along with distorted vocals from Shepherd, a sign that the singer/guitarist may still not feel entirely worthy singing the songs of Waters, although he certainly does alright playing them, as proven here. Like his earlier 10 Days Out: Blues from the Backroads project (check it out if you haven’t already), Goin’ Home is another solid effort from Shepherd at helping to keep the blues alive. With its heavy blues focus, it’s possible that Goin’ Home may not be Shepherd’s best-selling album (though we hope we’re wrong on that), but it is certainly one of his best. This entry was posted in Albums and tagged Chris Layton, Joe Walsh, Keb Mo, Kenny Wayne Shepherd, Kim Wilson, Noah Hunt, Rebirth Brass Band, Riley Osbourn, Ringo Starr, Robert Randolph, Tony Franklin, Warren Haynes. Bookmark the permalink.